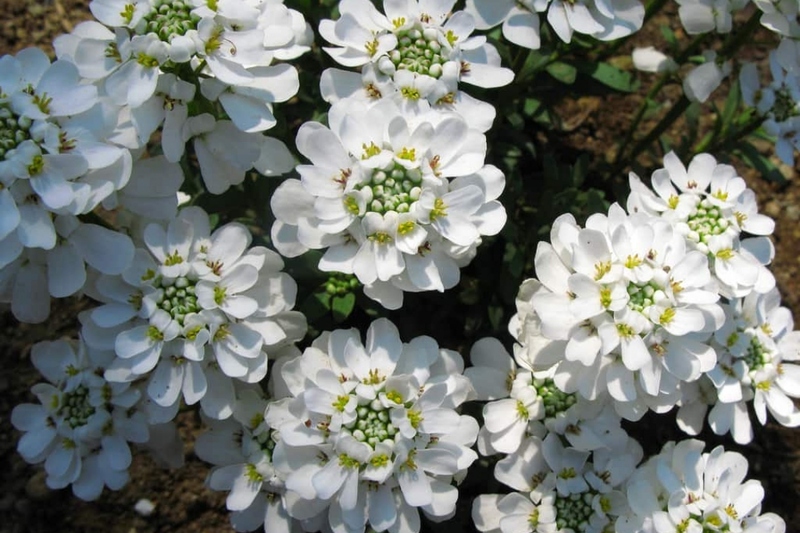 Evergreen candytuft (Iberis sempervirens): growing, planting, caring. A spring-blooming favourite, often seen cascading over rocks and walls, or used as groundcover. Iberis sempervirens - the evergreen candytuft - is a species of flowering plant in the family Brassicaceae native to southern Europe, often used as a decorative shrub because of the decorative flowers. Iberis is so named because most members of the genus come from the Iberian Peninsula in south west Europe, and sempervirens means "always green", referring to the evergreen foliage. It is a spreading subshrub growing to 30 cm (12 in) tall, with a glossy, evergreen foliage forming a billowing mound, and many fragrant, pure white flowers in tight clusters from spring to early summer. It is drought-tolerant once established, and prefers a well-drained site, so heavy clay soils that stay wet in winter should be avoided. Plant your Iberis in the sun in neutral limestone soil, even stony, from February to April and from September to November. Choose a drained location to help flowering. Prepare the soil by digging (to decompact without necessarily turning it, with a pitchfork or a broadfork), a scratching and a raking on 40x40 cm. Plant with a spacing of 50 cm between the plants. Tamp the soil well to avoid air around the roots, then water thoroughly. To plant in pots, choose a pot of about ten liters, and add a few centimeters of gravel at the bottom. Then fill partially with a mixture of soil and fibrous compost or potting soil, arrange your plant straight, then add mixture up to a few centimeters from the edge. During the first month, water once or twice a week. Water adult plants by big inputs even if you do it less often; the plant will develop a better root system if it has to fetch its water in depth. When watering, wait until the water that you pour stops rushing into the ground, and forms a small puddle. Do not wet the foliage, especially in the evening because it will be all the more attractive for molluscs. Then you should water only in case your plant is in pot. Established Candytuft plants can be propagated by division in Spring. Propagation is possible with semi-woody cuttings in July-August. This involves taking short twigs with one or two leaves, dipping them in a cuttings hormone and immersing them partially for a few weeks until roots form. Mulch, especially the first years! This will prevent you some watering and weeding, and even provide a slight fertilization to the soil by decomposing itself. To choose, know that dry milled wood is the most inert, but it will hold longer. Fresh crushed wood and leaves enrich the soil even more, but need to be renewed more often. Grass clippings are to be used in a layer of 1 cm maximum mixed with something else. Mulch in a layer at least 5 cm thick for good efficiency, and not just a cosmetic effect. We advise you to trim your candytuft regularly after flowering, to keep them compact. This pruning consist in slightly shortening the end of each branch, not to give it a military cut with a hedge trimmer!